Artists spend their lives collecting; gathering materials, experiences and ideas. The information they bring back to the studio is then rearranged, reinterpreted, played with, added to, taken away and changed to become a unique language, a point of view. Dale Kentwell has worked as a bush regenerator for the past 30 years and her art practice has been informed by this intimate connection to the landscape. In these works, she explores the fragility and vulnerability of our natural environment, where our bushland is only valued monetarily, with land clearing and tree poisoning a common occurrence. The interconnectedness of our natural systems is ignored, leading to extinctions of both plant and animal species. 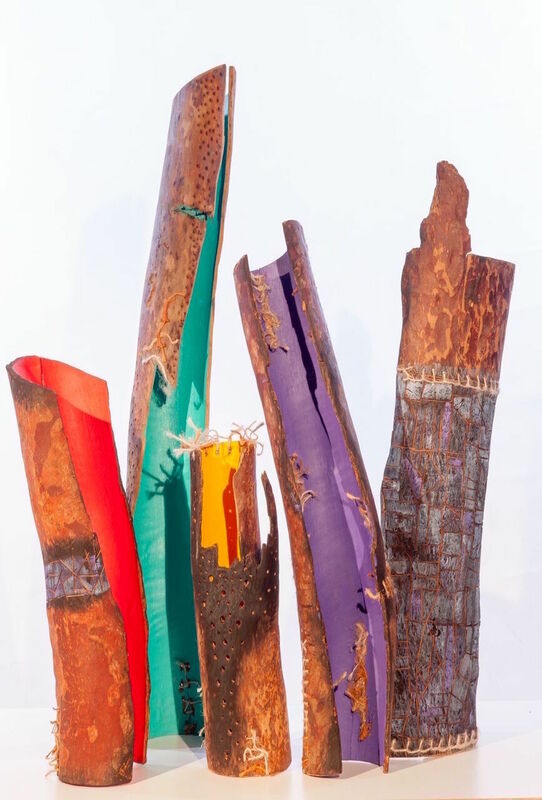 These bark pieces represent reparation and regeneration where they have been burnt, drilled and stitched, highlighting the contrast between hope and despair, destruction and renewal.